Are you feeling down? Cynical? In need of a pick-me-up? Not a perfect movie, and a little derivative maybe, but the latest from writer/director John Carney (Once) is the kind of film that just puts a smile on your face. It’s about a group of kids who form a band in 1980s Dublin, their search for the right sound, and the lead kid’s attempt to woo a troubled girl he’s met. Like Once, this movie involves characters encouraging and inspiring each other to pursue their dreams and talents. Though, while the end to Once was ambiguously optimistic, this one will probably just leave you cheering. The characters are great, even when portrayed by some inexperienced actors, the music is fun, plus there’s all of the 80s nostalgia. If you grew up in that time frame, in Dublin or not, the costumes and band references will be an added layer of enjoyment. Sometimes you need a movie that just makes you feel good, and while there are some serious elements involving family troubles, disappointments, and bullies (both young and old), the overall theme is one of triumph. Or, at least potential triumph. Yes, another Star Wars movie. To some, like me, that is a happy thing. To others, it’s some other kind of thing. But even to someone like me, if there’s going to be a whole bunch of Star Wars movies, they need to be good. Otherwise, I will grow weary of them as well (see: Marvel movies). Was this one good? Yes. Was it great? Not in my opinion. So that’s nitpicking, but on a broader scope, I felt the first half was kind of slow and not compelling. At least, not as compelling as it could be. We hop around from place to place so much that there’s no time to build momentum with the characters or story. It took me until the third act to really get into it. That’s when the emotional content of the movie picked up and I really started to enjoy it. And then there’s one scene near the end that’s one of the best in any Star Wars movie, so that helped me leave the theater with a good taste in my mouth. But I’m still trying to put my finger on why the first half didn’t grab me as much as The Force Awakens did when I first saw it. Maybe it just comes down to the characters. 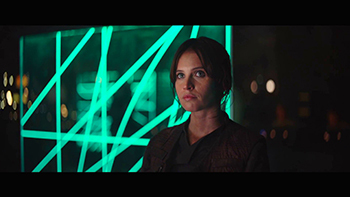 I never really got on board with Jyn Erso’s motivation. Heck, the teaser trailer had more backstory on her, most of which was apparently cut before it made it to the final print. Perhaps there will be a director’s cut on blu-ray that includes all of those lost scenes. After hearing about all the re-shoots/rewrites to give it more ‘levity’, the thought of a director’s cut is very inviting. To wrap up, if you’re a fan, you’ll like it. Maybe not love it, but definitely like it. Especially K-2SO, he’s funny.